I know the title quote is not how it officially goes, but for me and Uka it's something that we're starting to believe. We have so much fun in the kitchen together! Although we live in NYC where there are so many amazing restaurants, we cook 99.9% of our meals. After being traumatized by Upton Sinlair's The Jungle in 8th grade, Fast Food Nation in college and now The Omnivore's Dilemma I definitely prefer it this way. Food Network's announcement of its Cooking Channel launch has inspired me to provide a round-up of my favorite cooks. I may have a few more to add once I check out the new channel. 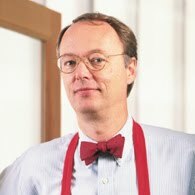 I've posted before about my love for America's Test Kitchen. Well, Christopher is the brains behind the operation. I appreciate his nerdy, no-nonsense manner and I kinda like his matter-of-fact, know-it-all nature (which I admit I can relate to!). What's really interesting is the fact that Christopher was raised on a farm and continues to raise his family on a farm in Vermont. He blogs about his experiences here and the monthly ATK newsletters often include stories from his farm and pictures. His farm sells maple syrup and each year they run out. I keep telling myself I'll buy some, but I'm actually a fan of processed syrup for my pancakes/waffles and only the real stuff for cooking! Growing up and being the nerdy child that I was, I liked watching Julia on PBS. Also, when Bill Cosby would do his impersonations on The Cosby Show I found it especially funny since my dad liked being in the kitchen too - baking mostly - and it kinda reminded me of him! While I did read Julie and Julia, I wasn't really interested in seeing the movie. However Julia's book My Life in France was much better than J&J and is now one of my favorite books. Julia beautifully told her and Paul's love story, and while I haven't made any of Julia's recipes, I thoroughly enjoyed her book. I really appreciate Ina's simplicity and classic recipes. 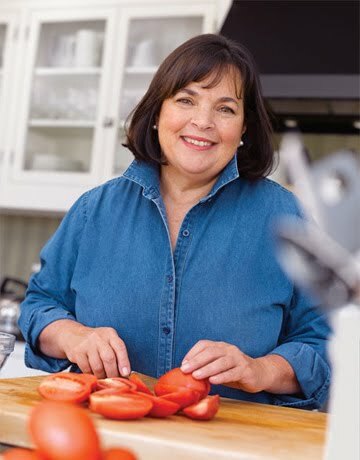 She's not afraid to use "good" ingredients - a generic adjective she frequently uses - and she often reminds me of a more polished Paula Deen in how she doesn't attempt to be health conscious. 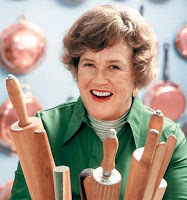 Her East Coast approach to cooking is easy to relate to, and I often wonder how flavorful her dished really are (I have to admit I haven't made any of her recipes! ), but for the most part I just really like her soothing voice and the views of the Hamptons. She frequently has friends as guests on the show and I wish she'd have more diverse friends, especially coming from New York, but I guess that's not her "target audience." 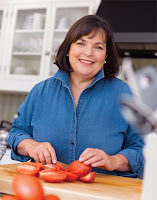 I did pick up Ina's book Barefoot Contessa at Home from the library recently, and I've found the recipes appear to be very simple and straightforward. There's a recipe for guacamole salad which looks good so perhaps I'll give it a try and post my review this summer. If any of our readers get to it first, please let me know how it turns out! One quick note: Ina's backstory is very interesting too. She has no formal culinary training and is self-made. I always like women entrepreneurs, and I find her story inspiring. You can read it here. Giada is always in such beautiful kitchens on her show and her recipes really make Italian cooking accessible. Uka finds her quite annoying and thinks she has a bobble head, as do apparently many others (! ), but I think she's cute and sweet! One little gripe I do have is when she suddenly gets an Italian accent just for Italian words, almost like "Foreign Accent Syndrome" or something. Like Ina, I've always wished Giada would have more diverse friends as guests on her show. I did get excited when I saw she threw a baby shower for a black girlfriend of hers. It was a rare sighting! I don't know what it is that makes me want to see TV personalities with diverse groups of friends (don't get me started on the show Friends or SATC), but maybe it's just because I enjoy having such a diverse group of friends that I think everyone else should too! 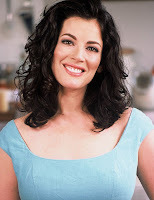 Honestly, I just like watching Nigella for her yummy British accent. She's another one who doesn't care about using heavy cream, butter or mayonnaise, but she takes utter pleasure in her food. Nigella is also quite voluptuous and makes me proud to be curvy! I also like the fact that her dinner table is beautifully decorated and her tastes are very whimsy. Best of all, she always has diverse friends around her table - I'd love to be at one of her dinner parties. Now maybe it's out there, but I haven't seen it, but I think it'd be fun to have a cooking show where a family with children is actually shown cooking. In reality that's how many families cook - with children underfoot. I know it might be hard to schedule filming cause of school but maybe a web-based cooking program would work. Who knows, we just might start one with the Agbai children in a few years . . . I love cooking too! I like knowing what exactly goes into my meals. After reading a few of the books you mentioned in this post and watching Food Inc., I'm a strong believer in all natural ingredients. You might like the Pioneer Woman too http://thepioneerwoman.com/. 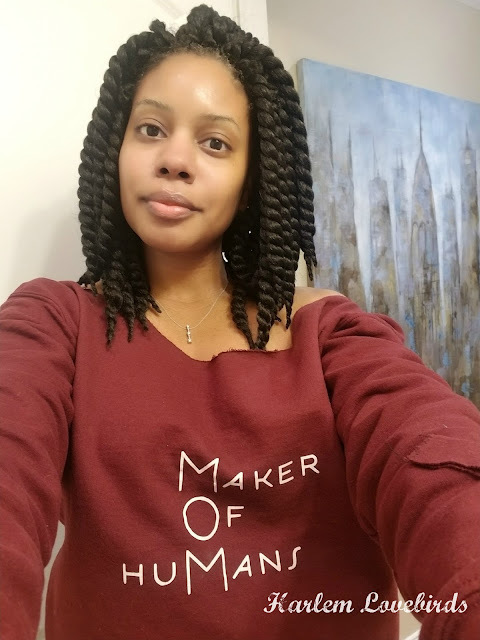 I love her blog.